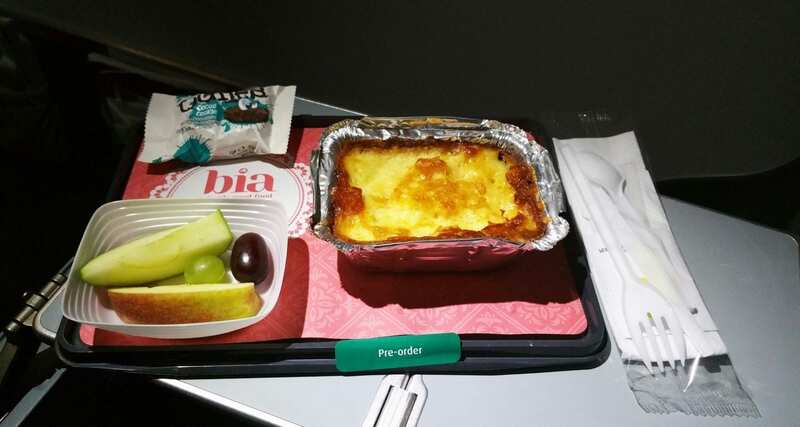 Over the last six months or so we’ve been flying a lot with Aer Lingus, so much so that we managed to sample pretty much everything on the inflight menu! 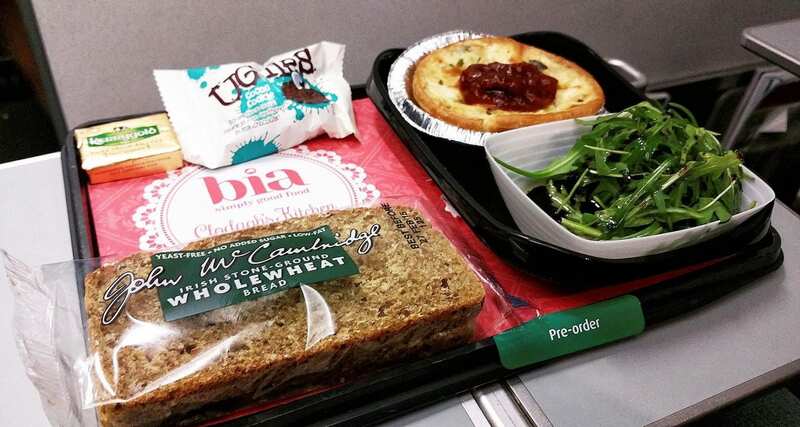 For those of you unaware Aer Lingus does not include food or drinks on flights across Europe. Instead, you can pre-order from a wide range of options or make a purchase inflight. For further information about their European menu check here. Menus have been designed in collaboration with Clodagh McKenna a local celebrity chef and most ingredients have been sourced from all over Ireland! The best part of flying with Aer Lingus is their cabin crew; they just can’t do enough for you and are ever so friendly. Note that the airline recently changed their pre-order program and these dishes are no longer available. The Irish Breakfast €9.99 – Sausages, bacon, black and white pudding, tomato, hash browns, bread, juice, tea or coffee. Leek and Cheese Quiche €7.50 – Cheddar onion and leek quiche which is served with the delicious Ballymaloe relish, rocket salad, Lilly O’Briens treat plus tea or coffee. Gluten Free Cottage Pie €7.50 – Consisting of Irish beef, onions, carrots, peas, gravy and mash! For dessert enjoy a strawberry and vanilla cream dessert plus tea or coffee. Succulent Steak €18.50 – (Note that this meal is only available for pre-order on long-haul routes, but I managed to get a tasting inflight on a European flight, thanks to the Aer Lingus team) This dish comes with smoked salmon, cucumber pickle, aioli & McCambridge’s brown bread. The steak is served with gratin, creamed spinach, mushrooms & a red wine jus. For dessert, there’s a raspberry pannacotta, Lily O’Brien sweet plus tea or coffee and red or white wine. Gluten Free Snack Pack €5.00 – Includes Belgian chocolate biscuit cake, cheese, and crackers, nut mix. Irish Breakfast – Typically Irish with all the right ingredients and very tasty, this breakfast is a favorite amongst passengers and is available onboard until 11 am if you want to eat this later in the day (like I did at 5 pm) you’ll need to pre-order it. Leek and Cheese Quiche – Was served hot and the relish really brings out the wonderful flavors of the cheese and leek. Cottage Pie – Reminded me of a home cooked meal, full of flavour this traditional Irish dish hit the spot and wasn’t too heavy. Macaroni and Cheese – This meal tasted a little bland was probably my least favorite dish however I realise that it’s made for children’s tastes, not adults. Succulent Steak – Looks can be deceiving. This steak was very juicy, tender and excellent quality, the potato gratin was delicious, and the starter salad was fresh. 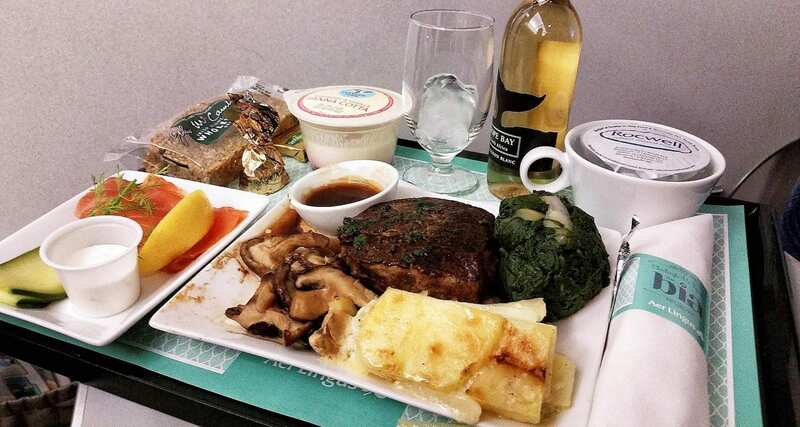 If I were flying long haul with Aer Lingus, I would use the meal upgrade service. 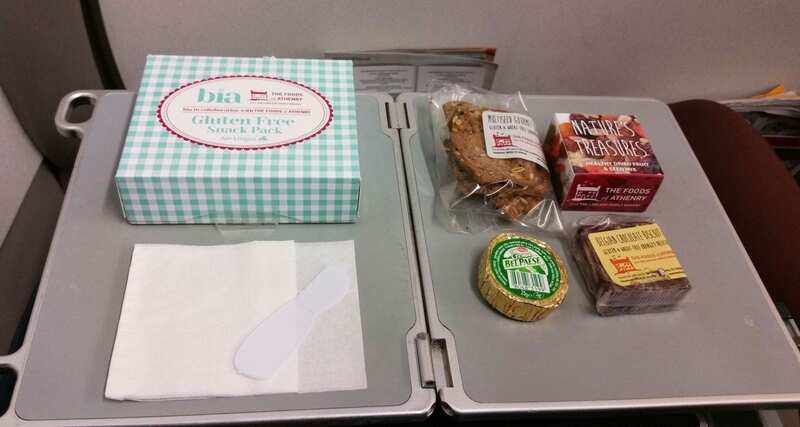 Gluten Free Pack – includes products from the Foods of Athenry bakery in the West of Ireland, the Belgian chocolate cake was divine and the other contents were of high quality, not your typical airline snack box! All meals offered excellent value for money, have been well thought out and give you a taste of Irish dishes inspired from around the country. Coupled with down to earth and friendly inflight service, I think this is a perfect mix for a great inflight meal experience.